You would have to be living in a different dimension not to have noticed to transformation is human behaviour in relation to the changing use of smartphones and tablets in daily life. 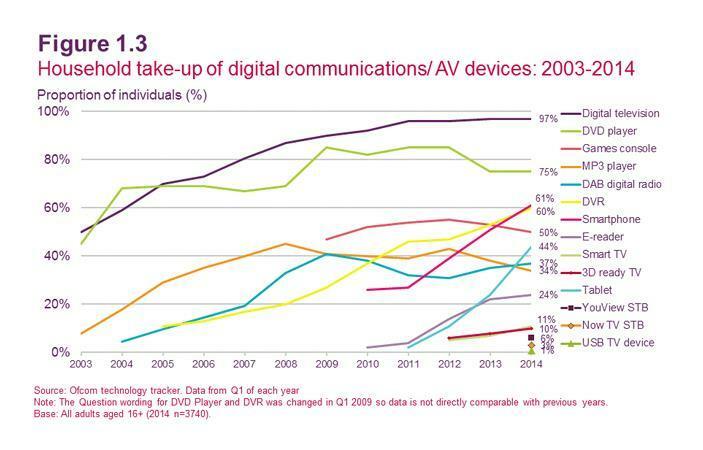 The Ofcom report identifies clearly the growth in ‘take-up’ of digital devices, see Fig 1.3 below, looking specifically at the indicators for smart phones and more notably tablets the graph shows huge grow in both of these device types. Smartphones - Use of smartphones has increased from 39% in 2011, to 51% in 2012 to a staggering 61% in 2013. Tablets - The use of Tablets has however revealed ever greater grow, from 11% in 2011 to 24% in 2012 and a monumental rise to 44% in 2013. Although the actual numbers of people with access to the internet as a whole remains fairly unchanged at around 82%. It is the way in which people connect to the internet is what’s interesting, with almost 60% of people using their mobile phones to connect to the internet, as substantial rise from a little over 50% at the beginning of 2013. This figure equates to almost every person that has a fixed internet connection also have access to the internet via their mobile telephone. 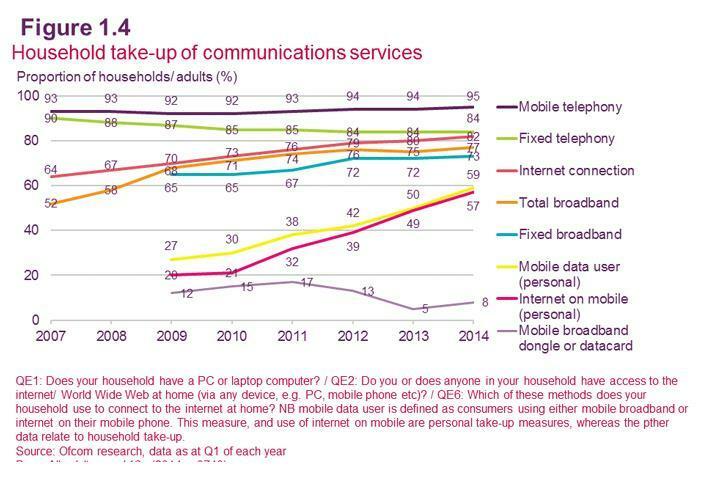 Pink line - ‘Internet on Mobile’ increase from 20% in 2009 to almost 60% in 2014. 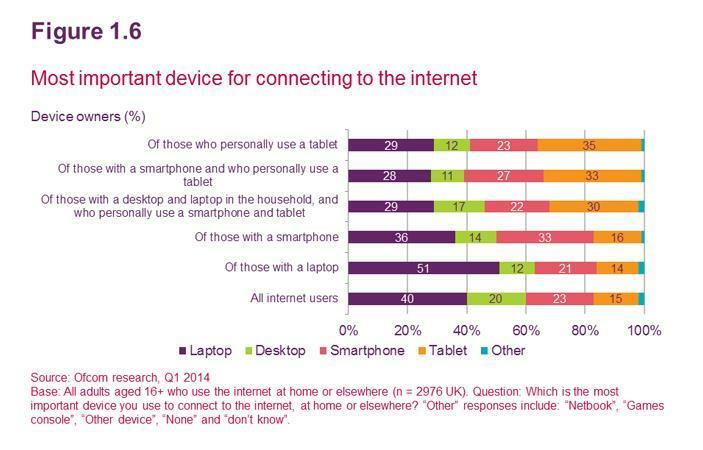 Whilst the report as a whole has some interesting and fairly remarkable statistics, perhaps the most notable, if not almost unbelievable, is that the tablet is seen as being the ‘most important device for connecting to the internet’ by those with a desktop and laptop in the household and who personally use a smartphone and a tablet.